The sets are different in several regards. 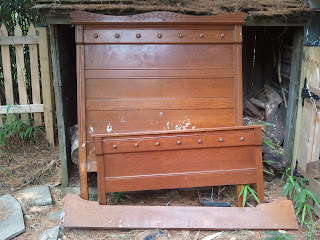 First, the set I restored earlier was made 20 years earlier. 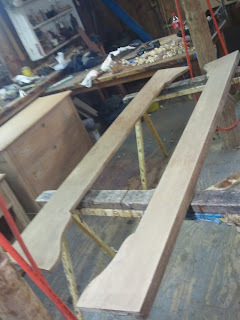 The wood that was in vogue at that time was Walnut. By the turn of the century, factories had moved onto Oak and this period is often referred to as the Golden Oak period. Another difference is that the Oak set employs the use of a machined dovetail in the drawer construction. This is how I was able to date the pieces. 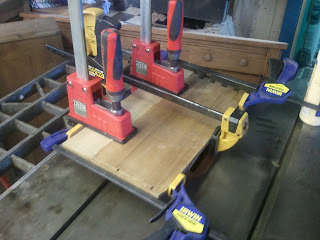 The earlier set had a pseudo machined dovetail which is called a Knapp joint. I have written extensively about that joint and a search on this blog will provide you with more information about it. 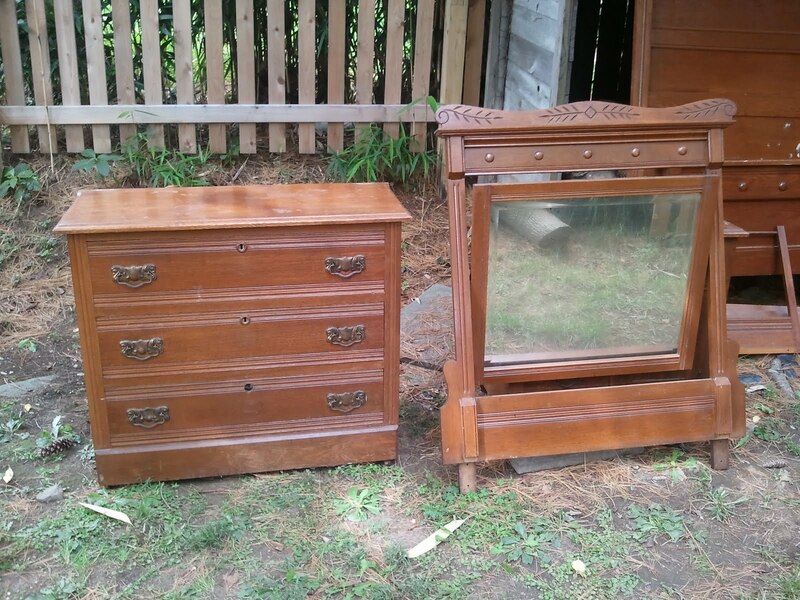 Other differences between the two sets are that the earlier (Walnut) had Tennessee Marble tops and veneered drawer fronts. 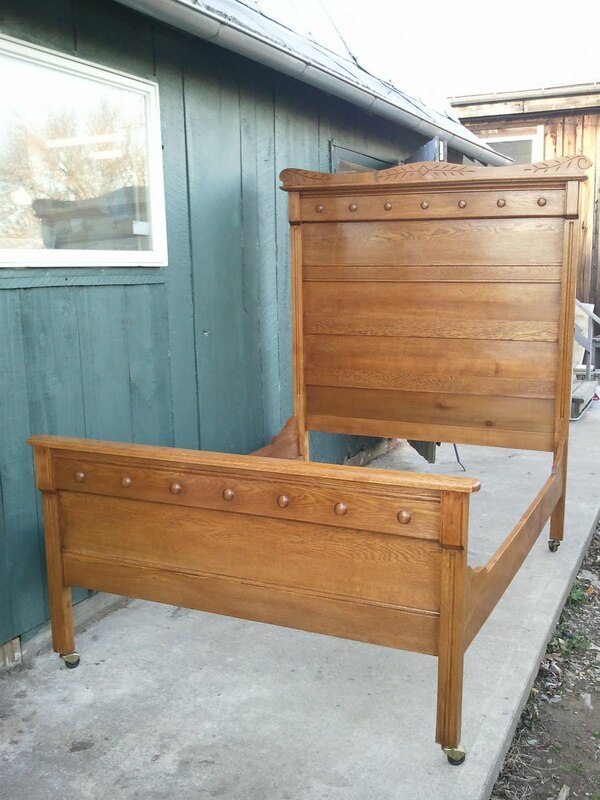 Both of those elements are missing from this Oak set. Perhaps they were available in more expensive models. 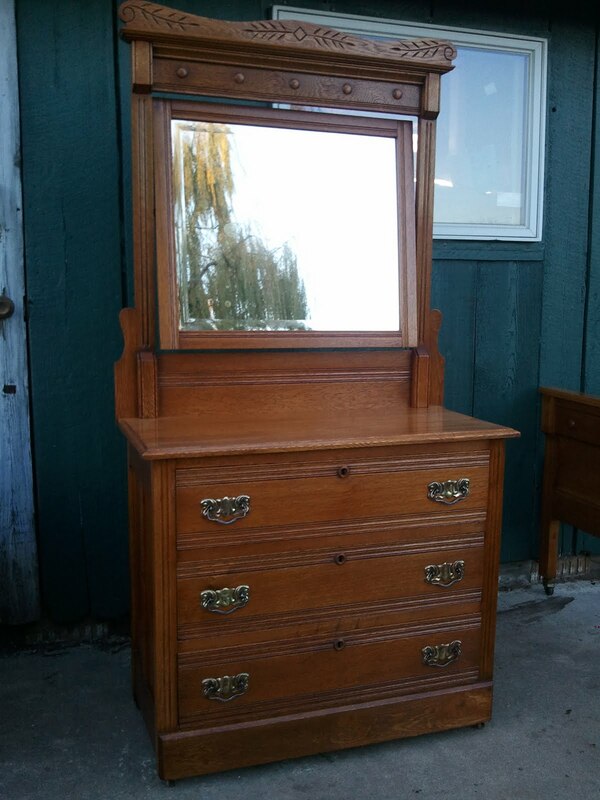 The last difference is the absence of candle stick holders on the oak mirror frame. Perhaps this is signifying the move towards electric light over candlelight. Or perhaps this is a detail that was left out for cost or shipping reasons. Overall, the set was in pretty good shape. 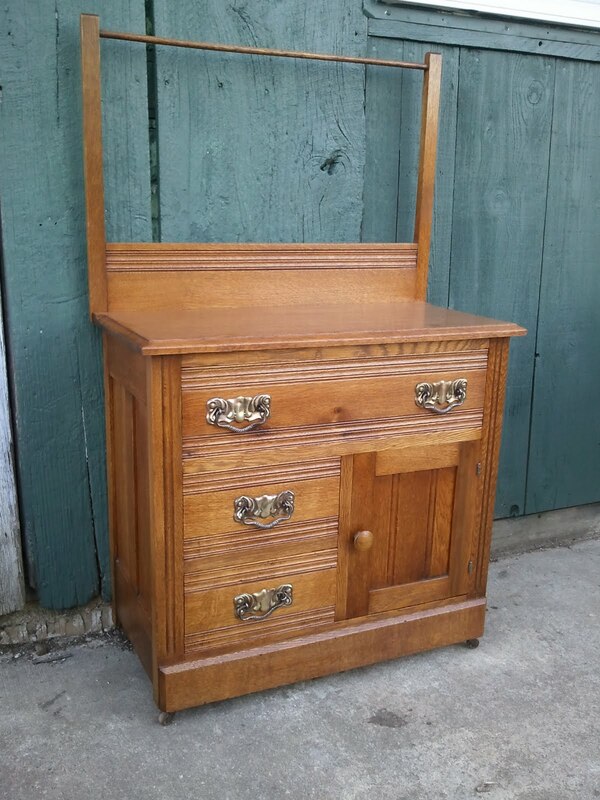 One thing about Oak is that it is solid as a rock! It makes for some sturdy furniture. I have broken this post into three sections below which deal with the three pieces in the set. 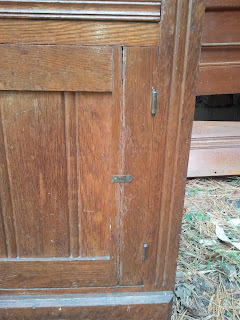 The washstand below had some structural damage to the door . It also needed new drawer runners and the finish was removed and replaced with a new one. 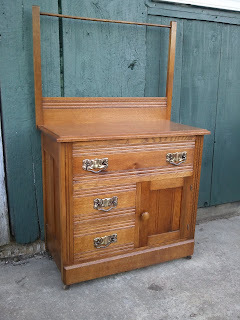 The piece was selectively stained and coated with a French Polish and then waxed. The hardware was also cleaned and everything was brought back to proper functioning order. 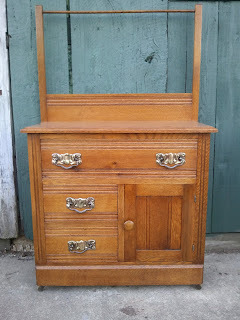 Here is a photo of the washstand as it came to me. The towel rack was removed in this photo. These next two photos show the damage to the door. 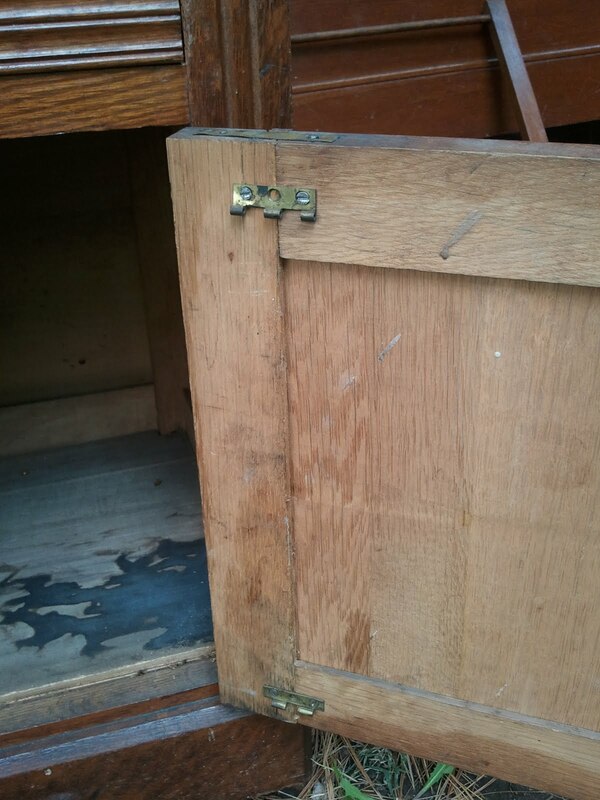 A previous repair was attempted by breaking an old hinge apart and screwing it on either side of the break. All of this was removed and the door was properly repaired. 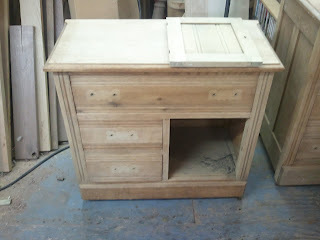 This photo shows the washstand after the finish was removed and the piece was sanded. 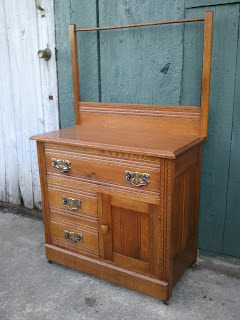 These three photos show the restored washstand from a few angles. 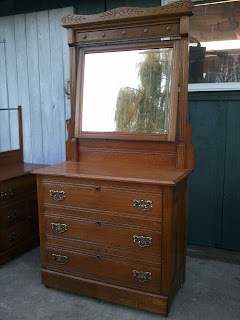 The Chest with mirror is seen in the photo below as it came to me. The mirror had the original glass with a beveled edge. 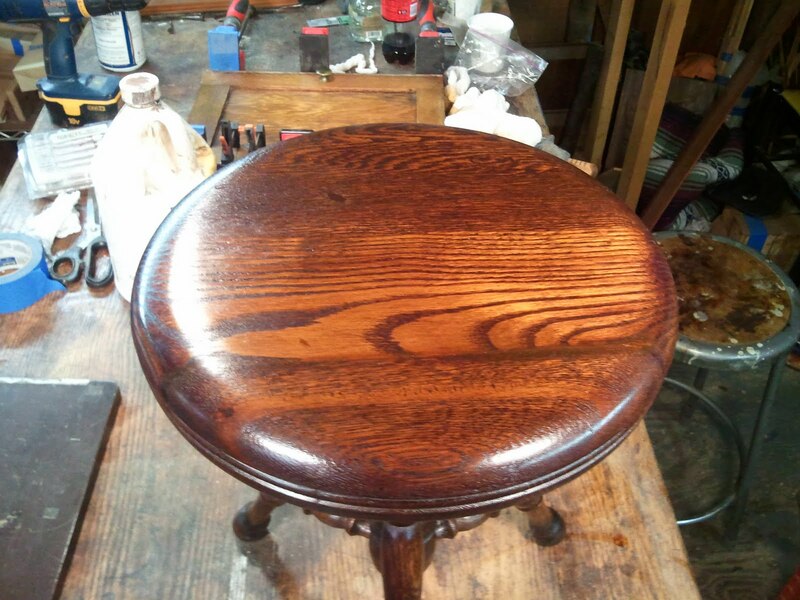 One repair that was not documented with photographs was the removal of a large oil stain in the top. 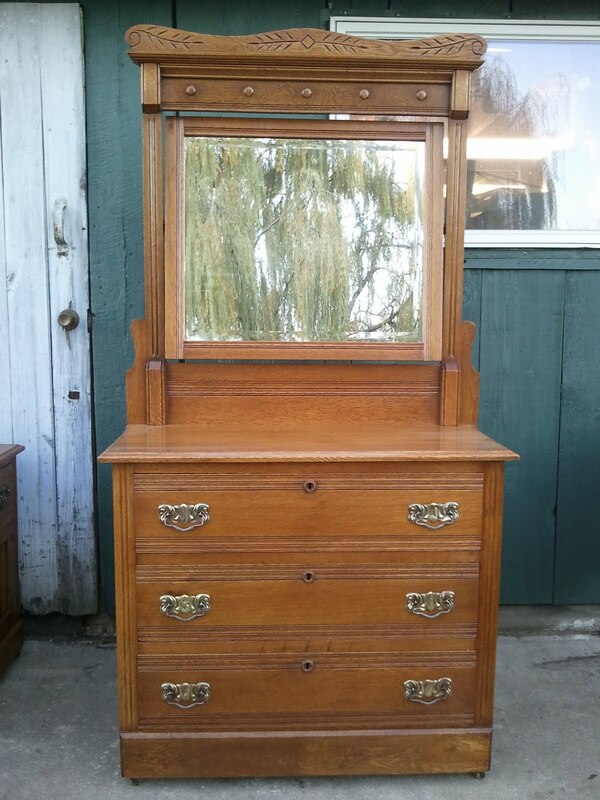 Most likely, this stain was from a oil lamp breaking, or cracking on the top of the dresser. 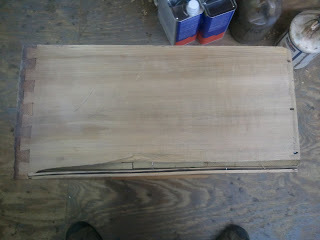 After the finish was removed, the stain could not be sanded out. 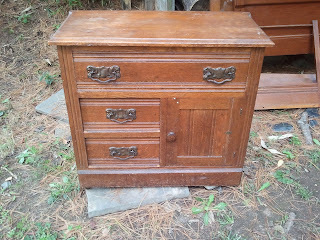 The answer was to bleach the top using a special wood bleach. 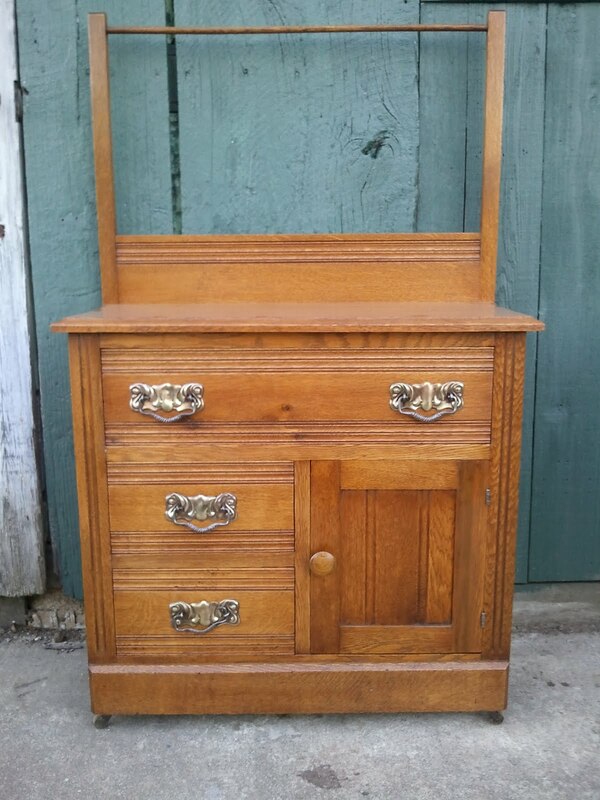 Once the top was bleached the stain was gone. 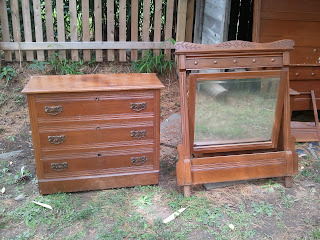 The top was then sanded and stained to match the color of the rest of the set. If you look closely in the photo below you can see the stain on the the top of the dresser. The drawers had some significant runner damage. The one in the photo below was the worst. To fix the runner on this particular drawer, the drawer was disassembled, and the broken area was removed. 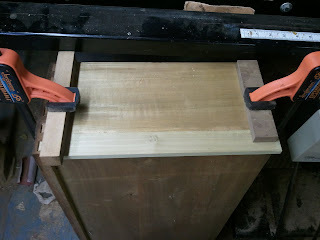 I then added new wood to the drawer side to build it back up and cut new dovetails to fit it back into place. This photo shows the drawer side being glued back in place. This photo shows material being added to all of the drawer runners for the chest ( and the washstand). 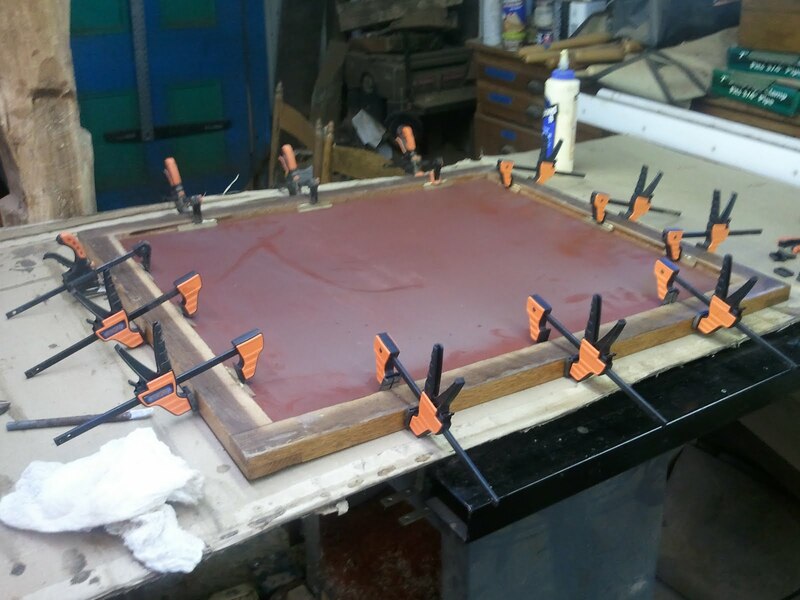 This photo shows the blocks that hold the mirror glass in place being glued in place. These last three photos show the completed dresser with mirror. The bed had some minor repairs to it. 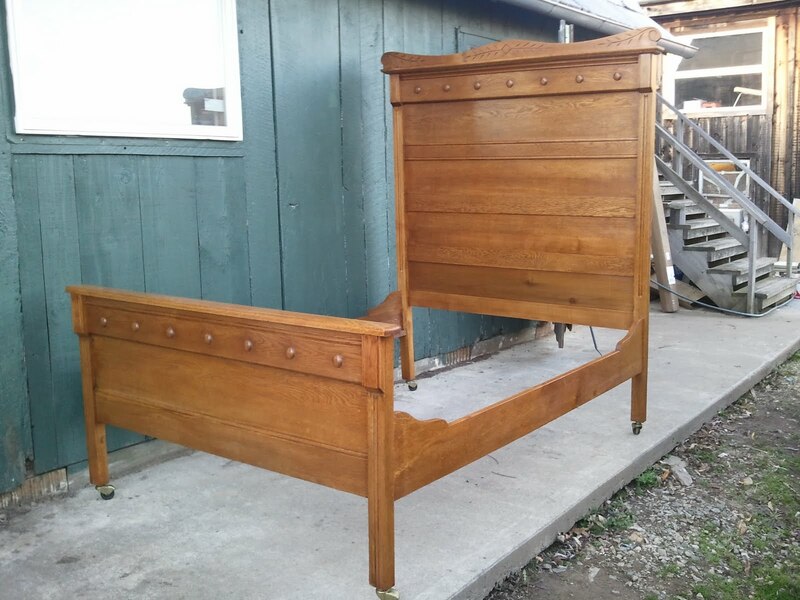 The main issue with this piece was the finish and some mysterious white paint like substance on the headboard. This was quickly removed with the finish and the bed was sanded, selectively stained, and refinished. The photo below shows the bed as it came to me. 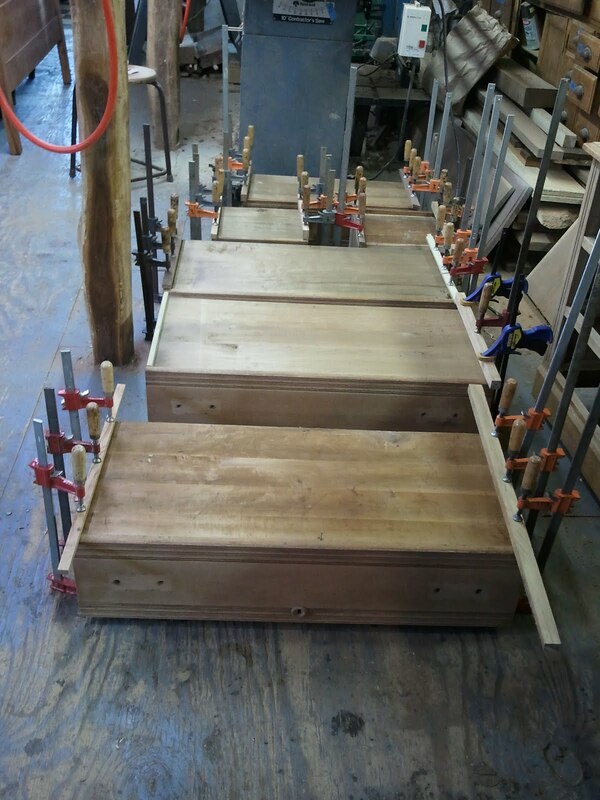 This photo shows the rails after the finish was removed. These last two photos show the bed fully restored. 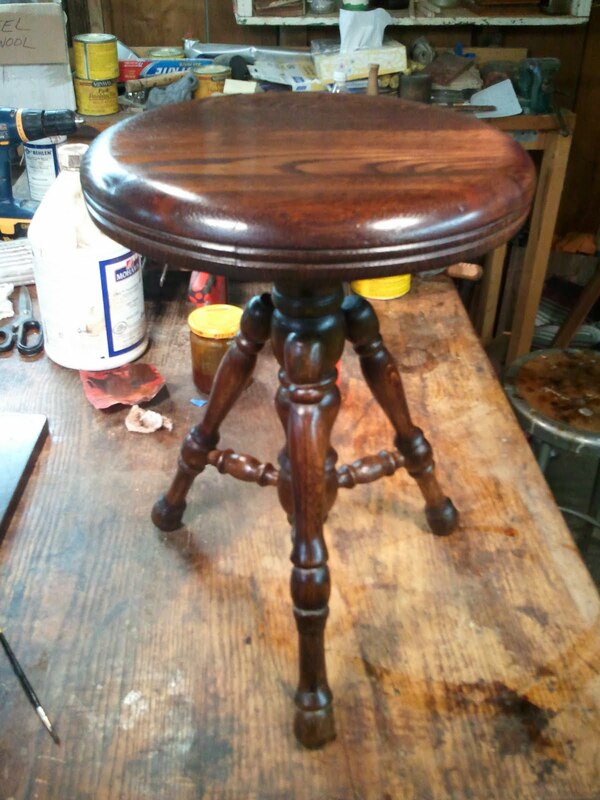 Another piece that I restored for Christmas was an Oak piano stool made by H.Holtzman and Sons in Columbus, Ohio. 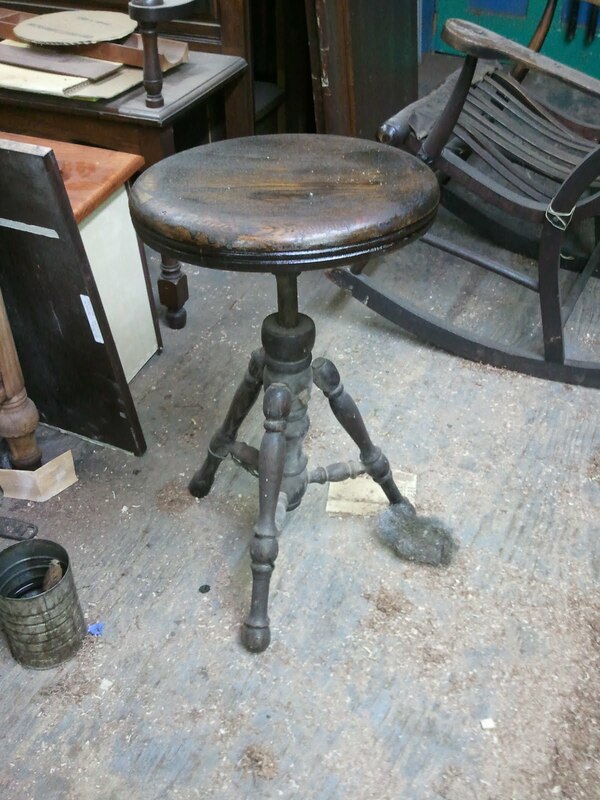 Judging by the history of the company and also by the overall condition and style of the stool, I judged it's age to be right around 1900, give or take 10 years. 2121 t0 2122 E. Main St. 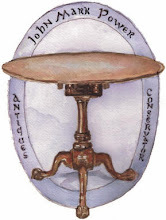 They certainly did produce a large variety of piano stools, a quick Google search will show images of many different styles of stools made from many different types of wood. As for the piano covers, it is hard to know much more about that side of the business. 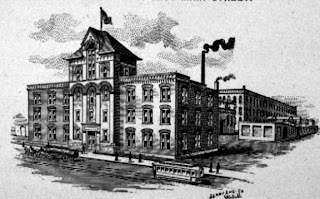 The factory mentioned in the advertisement has been demolished now, but I was able to find an image of it which I have provided below. The business seems to have had it's heyday in the early part of the 2oth century. I found many references to it and one included mention of a Chicago branch of the company. The business was run by various members of the Holtzman Family until it closed in 1959. 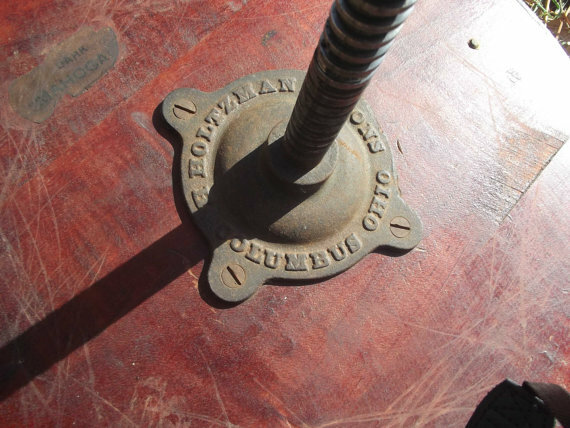 I was able to find out the manufacturer of this stool because the mounting plate for the screw mechanism on the underside of the seat had the words "H.Holtzman and Sons Colum, Ohio" Cast in it. I neglected to get a photo of this, but was able to find a photo of a similar (and later) mounting plate on the internet. Here is a photo of the stool when it arrived in my shop. The finish was in bad shape and the joinery on the stool needed some repair work.There was also a crack in the seat that needed to be filled. 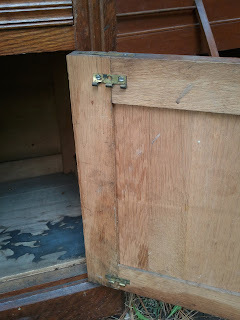 One of the legs had been replaced during the lifetime of the stool, and it had later been repaired at the top joint with a large bolt going through the main post. This had great visual appeal, and the customer and I decided it was part of the history of the stool and should be left in place. This was until I discovered that the bolt was preventing the stool from raising and lowering fully. With this in mind, the bolt was removed and the joinery fixed on the leg. All off the other repairs were made and a new finish put on the stool. 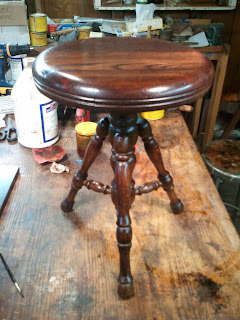 Here are two photos of the stool after it was completed.